Doubanjiang (IPA: [tôupântɕjâŋ]), or simply Douban, or Toban-djan, Chili bean sauce, is a spicy, salty paste made from fermented broad beans, soybeans, salt, rice, and various spices. Doubanjiang exists in plain and spicy versions, with the latter containing red chili peppers and called la doubanjiang (Chinese: 辣豆瓣醬 pinyin: là dòubànjiàng; 辣, là meaning “hot” or “spicy”). It is used particularly in Sichuan cuisine, and in fact, the people of the province commonly refer to it as “the soul of Sichuan cuisine”. A particularly well-known variety is called Pixian Douban (Chinese: 郫縣豆瓣; pinyin: Píxiàn dòubàn), named after the district of Pixian, Sichuan. ^ Holliday, Taylor. 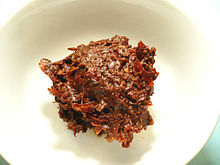 “Sourcing Pixian Douban Jiang (Chili Bean Paste)”. The Mala Project. Retrieved 28 February 2016.